Shinjuku Station is the world's busiest public transit station. With numerous train, subway, and public transportation lines, it is easy to become confused about changing trains. In this article, we explain the transfer process for each line. 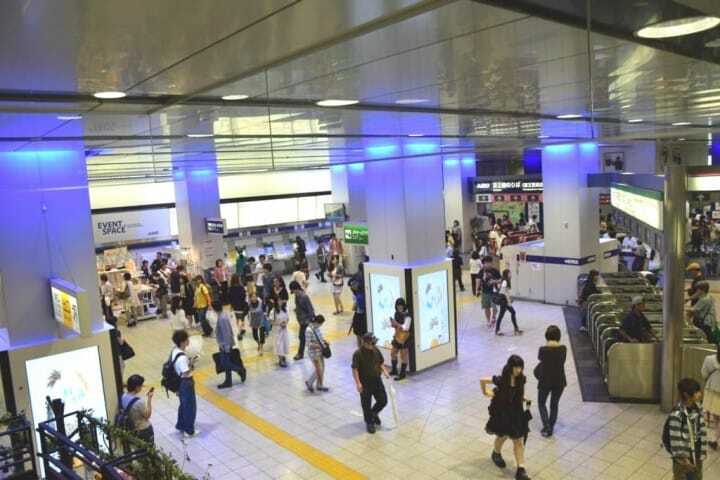 This article aims to help guide beginners and those using Shinjuku Station for the first time. We explain how to change trains and subway trains at JR Shinjuku Station so that you won't feel or get lost. ** You can skip to the information about each lines by clicking on its name. 1.Odakyu Line Hakone, Shimokitazawa, etc. 2.Keio Line Mount Takao, Hachioji, etc. 3．Tokyo Metro Marunouchi Line Ginza, Koishikawa Korakuen, etc. 4.Toei Oedo Line Tsukiji, Roppongi (Japanese), etc. 5.Toei Shinjuku Line Jinbocho, etc. 7.Seibu Shinjuku Line Takadanobaba, Honkawagoe, etc. Shinjuku Station on Tokyo Metro Toei Line consists of several different stations and not only Shinjuku Station. There are also Shinjuku-Sanchome Station, Shinjuku-Nishiguchi Station, which are all within walking distance of each other. The only difference between these stations is whether or not you’ll pass one more station on your route before arriving at your desired destination. In this article we focus exclusively on Shinjuku Station. You’ll find gates (exits) at JR Shinjuku Station on two separate floors, both under and above ground. The main gates are the east gate (higashiguchi), the west gate (nishiguchi), and the south gate (minamiguchi). Please note that the east and the west gates are underground, and the south gate is above ground. There are several possible transit routes for each and every line, but in this article, we will try to explain some of them in an understandable way. Once you’ve climbed the stairs, a spacious hall will appear in front of you. At the very end is the gate for the Odakyu Line. The ticket machines are to the left of the gate. The main west gate (chuo nishiguchi) is used for both JR Shinjuku Station and the Odakyu Line, so, if you have an IC card and don’t need to buy a paper ticket, we suggest using this gate. The neighboring gate is Keio Line transit gate, so you should follow the blue mark (pictured above). We recommend memorizing that the Odakyu Line is marked with blue. This gate is for transfers only, so if you wish to go above ground or leave the inner zone, use the west gate. The Keio Line was created in order to connect Shinjuku with Hachioji. This line is convenient to use for visiting the west part of Tokyo and Mt. Takao. It takes around 50 minutes by limited-express train from Shinjuku Station to Takaosanguchi Station (the closest station to Mt. Takao), and the fee is 390 yen. After you’ve passed the west gate you’ll see the Odakyu ox SHOP on your left, and a large sign in front of you. To get to the Keio Line, turn left. Pass the narrow hallway with coin lockers, and keep straight. Follow the path between the omusubi (rice ball) restaurant in front of you, and the curry restaurant Curry Shop C&C. But, be warned, as the curry restaurant entices commuters with its irresistibly delicious aroma. As soon as you pass the hall and arrive at an open area, you will find the ticket gate on your left. Next to the Odakyu Line transit gate are stairs leading to the Keio Line. Take the stairs (pictured) down. Ascend the stairs at the end of the hall and you will see a pink ticket gate. This gate used for both the JR Line exit and the Keio Line entrance. We recommend these gates for passengers who don’t have to buy a paper ticket. To locate the underground gate of the Tokyo Metro, pass the east gate on B1F. Use the stairs on your left after you’ve passed through the east gate (higashiguchi). At the end of the stairs is an open area with multiple passages. Proceed diagonally to your right, and you will reach the Tokyo Metro Marunouchi Line ticket gates. Use this line to visit Ginza (Ginza Station), Koishikawa Korakuen garden (Korakuen Station), or Tokyo Dome City (Korakuen Station). Particularly confusing lines are the Toei Oedo and Shinjuku Lines, and the Keio Shin (New) Line. The Oedo Line leads to Roppongi, and Shinjuku Line to Jimbocho, a neighborhood known for its bookstores. Since these lines share the same ticket gate, we recommend memorizing them as a set. Also, this route is along part of the path from the central west gate (chuonishiguchi) to the Keio Line. For the Keio Line, pass through the pink ticket gate. The green ticket gate on the left is for JR. Follow the path that leads under the sign marked with the red circle on your left. Turn left at the KEIO MALL sign. Proceed further and look for a sign with "Toei Oedo Line" written on it, with the ticket gate in front. Don’t get confused if you see the Oedo Line ticket gate on the right side, too. Please note this ticket gate is for the Oedo Line only. If you intend to ride on the Keio Shin Line or the Shinjuku Line, use the ticket gate that appeared in front of you after you’ve turned left at the KEIO MALL sign. Seibu Shinjuku Line is further from JR Shinjuku Station than other the transportation lines. Use the Seibu Shinjuku Line to go to Takadanobaba Station to visit Waseda University, or Honkawagoe Station, if your plan includes seeing Kawagoe Hikawa Shrine, the famous love shrine. Use the east gate (higashiguchi) to exit from JR Shinjuku Station. The square near the east exit leads to Kabukicho, but you have to turn in the right direction. Shinjuku Station should be right behind you. As soon as you reach the passage next to the Don Quijote store, cross the street and turn left. After continuing on, the next thing to for look for is a sign with Pe Pe on it. You will then see a brown building, which is for the Seibu Shinjuku Line. Go under the Pe Pe sign. The gate is at the end of the path. If You Miss an Exit, Remain Calm and Check the Signs! Just as stated in the following table, you can change trains using gates not introduced in this article, too. If you pass the gates (exit) and are not sure where to go next, there is no need to panic. Simply check the signs to find the information you need. If you feel confused by the information written on the signs along the way, don’t hesitate to ask the directions at the information desk. You can also consult with a station employee directly. Master the transfer process for a fun, carefree trip! ** This is a revision of an article published on July 13, 2015.